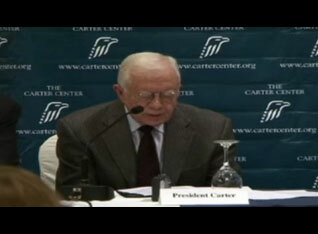 Things are wrapping up here for this phase of the Carter Center's election observation mission to Lebanon. Our long-term observers will remain deployed to monitor the post-election processes. We held our press conference today, and you can watch remarks from President Carter and former Yemeni Prime Minister Abdul Karim al-Eryani on the video above. Their words will be much more compelling than my own. Tomorrow's blog entry will be a series of reflections from members of our delegation, who have worked for many months to make this mission possible and have unique insights to share about this important democratic moment in Lebanon's history. Deborah Hakes will blog daily from the Lebanon elections through June 10.